It wasn’t quite the one he wanted, but Sergey Karjakin is World Blitz Champion after edging out Magnus Carlsen on tiebreaks in a thrilling final day of the World Rapid and Blitz in Doha. For most chess players tying for first twice and taking home $68,667 would be considered a good five days’ work, but Magnus was upset enough to storm away from the celebrations. Daniil Dubov took bronze, while in the women’s event Anna Muzychuk won her last five games to claim a brilliant rapid and blitz double gold. This title actually means a lot because after I lost my match against Magnus I felt like ok, it was a good match, but I still need to do something to be satisfied… and now I’m satisfied! Alexander walked straight into the mother of all forks with 53…Rxc5?? 54.Ne6+ and ultimately Sergey not only drew but missed a win. The darkest moment for the Russian came after a game in which he’d outplayed Hikaru Nakamura and was searching for a way to convert his huge advantage. Instead he found the losing 69.Qg4?? ...while Sergey would go on to win five and draw one (vs. Korobov) of his remaining games. Sometimes he did it in real style, as against Peter Leko. It was just a brilliant game, sacrificing the rook. I would be happy to play such a game in rapid chess, but now it was at the end of the blitz tournament. The game was fantastic! Both opponents lived up to their reputations. Jobava managed to sacrifice a pawn on move 3 with an idea he’d ventured in one of the rapid games in Doha. The funny thing is that he played an opening which I have never seen in my life. It was just incredible. There was a happy ending for the Russian, though, as he went on to score a comfortable win, while Magnus’ attempts to whip up something against Leko only saw him come close to losing. He had nothing better than to take a draw by perpetual check. So Sergey Karjakin ended the defining year of his career so far as the World Blitz Champion. He'd earned the right to do some trolling! On the other hand, there was little arguing with the outcome. Yes, the tiebreaker based on the opponents’ ratings is arbitrary (Sergey Shipov said it was wrong to use a tiebreak not based on how people played in Doha), but Magnus would still have lost out on the more logical first tiebreaker of the score in games between the tied players. He lost to Ivanchuk in the rapid and Karjakin in the blitz and while, for instance, he could regret the Wojtaszek-Karjakin game, there was no sense that luck was particularly against him. As we saw, Karjakin blundered away a won position against Nakamura, while Baadur Jobava lost a game to Carlsen that he memorably claimed his grandmother would have won! Georgia is a powerhouse of women’s chess, so it’s quite possible she would have frowned on Jobava here giving up his bishop on c6 for the knight on g2 just when a race on two sides of the board was beginning. 42.Bxg2?! (42.Kc3!) didn’t yet throw away the win never mind lose, but it was a step towards disaster. The rest will give Jobava nightmares. You might also question the ease with which Vishy Anand succumbed in the following round, though the early resignation helped Vishy bounce back with a spectacular effort against Mamedyarov in the final round. All in all, it was perhaps the perfect result for chess fans. Magnus played excellent chess with a consistency none of his rivals could match over the five days, but still fell short of winning the titles. It means he’ll be even more hungry when he starts to defend his Tata Steel Masters title in Wijk aan Zee in two weeks’ time. One of his opponents there will, of course, be Sergey Karjakin! Day 1 high flyer Alexander Morozevich lost four of his last five games to finish in 30th place, while Marin Bosiocic, 5th after Day 1, finished 42nd after losing six of his last seven. Not everyone at the top dropped down, though. Daniil Dubov ended the first day in third place 1.5 points behind Sergey and Magnus and at the end of Day 2, after three wins and six draws, duly took the bronze medal. The big guns made their mark on the second day, though, with Nakamura (6 wins, 2 losses, 1 draw to Carlsen) and Grischuk (5 wins, 4 draws) tying with Dubov for 3-5 place, while MVL (3 wins, 5 draws, 1 loss to Carlsen) took sole sixth place. After 67…h2! 68.Rb1 Ne4! there was suddenly no defence against knight forks or simply Nf2 and queening the h-pawn. Hikaru chose 69.Rf1 and resigned after 69…h1=Q! It was fitting that Grischuk won, though, not just for his earlier play in that game but for his overall play in Doha, where his silver medal in the rapid ($32,666.67) and shared 3-5th place in the blitz ($21,333.33) made him the top earner after Magnus with $54,000. The strangest game of the day was the encounter between Egypt’s Ahmed Adly and Argentina’s Diego Flores on board 23 in round 16. It paid off for Adly to keep on playing in a rook vs. knight ending… eventually! When Flores realised he’d blundered he claimed a draw by the 50-move rule, but it turned out only 47 moves had been played since the last capture. Then he made a few more and claimed again, but at the second count the arbiter decided he’d again fallen just short. Then Flores’ plan was clearly to claim a third time, but with a second on his clock he just blitzed out moves and was mated on the board… with the arbiter pointing out no claim had been made. Vassily Ivanchuk provided the most memorable moment of the 2015 World Rapid and Blitz Championship when he jumped out of his chair when playing a winning move against Magnus Carlsen, and it’s fair to say he at least came very close to overshadowing Karjakin’s triumph. Vassily’s blitz tournament somewhat fizzled out after he beat Anand and Carlsen in consecutive rounds, but 9th place (tied for 7-12th) was another impressive performance. Where Ivanchuk really stood out, though, was at the medal ceremony, where he received the rapid gold medal, flowers and even managed to draw a smile from Magnus! Photos alone don't do it justice! Vassily will be back at the chessboard in Gibraltar in a few weeks’ time. While the top three remained unchanged from Day 1 in the open event, the women’s tournament saw a dramatic turnaround. Alexandra Kosteniuk lost five games to sink from 1st to 7th, while other players were on fire. Valentina Gunina won seven games and drew one, but it was only enough for silver, since Anna Muzychuk ended with five straight wins to take the title by half a point. 24.f4 and 24.Nf4 are among the winning moves, and Antoaneta’s 24.Nc7 didn’t yet spoil anything, but in a few more moves the attack was over, queens were off the board and Anna smoothly converted a better ending into 1st place. 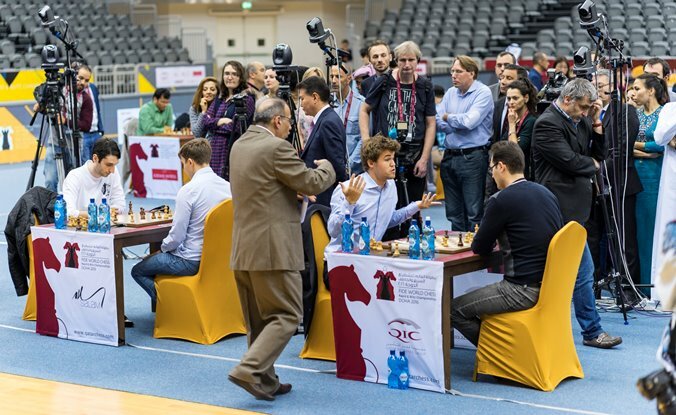 So that’s all for the 2016 World Rapid and Blitz Championship in Qatar. The year itself is also about to end, but we won’t have too long to wait for the top stars to be back in action. 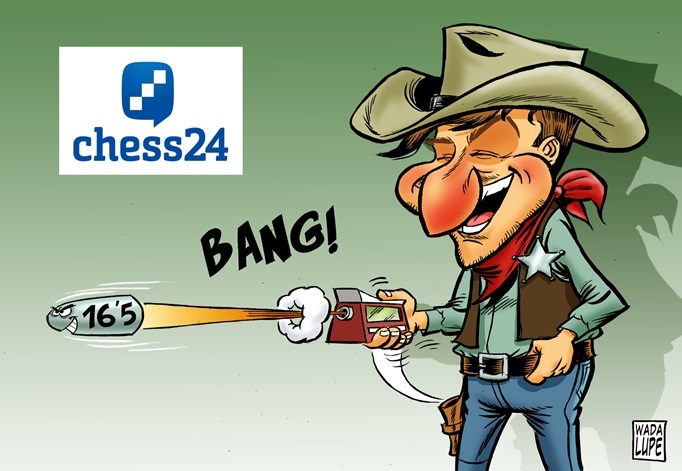 First off is Wijk aan Zee from 14 January, with Peter Svidler, Jan Gustafsson and Lawrence Trent all lined up to provide commentary here at chess24. First, though, check out Jan's Review of 2016!